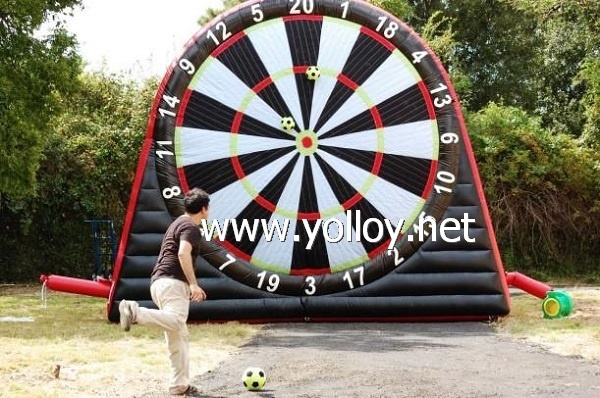 A giant inflatable dart board provides something different for your event , ideal to hire individually or as part of a games package.Giant inflatable football darts is a great novelty item for event hire, fun days, corporate events, team building, schools and youth and community groups. Football Darts unique combination of football and darts is sure to become a favorite pastime anywhere that fans of football can be found throughout the world. It can be played in sports bars, at tailgate events, as league tournaments, or as a leisure activity in the comfort of your home. Wherever there's Football Darts, there's real football action! If any interested in it,please do not hesitate to contact us,and we would like to assist you to produce the perfect items you want.